Philadelphia Eagles head coach Doug Pederson looks on during the second quarter against the Oakland Raiders. The real story in Monday night's 19-10 win over the Raiders isn't all that different from the one coming out of their previous win over the Giants. It's less about what happened on the field and more about what didn't. Yes, the Eagles won again and clinched home-field throughout the postseason in the process, but that advantage won't last very long if they continue down their current path. When Carson Wentz went down with a torn ACL against the Rams, the Birds had three games to find a winning formula with Nick Foles behind center. Now two-thirds of the way through those games, with just the season finale against the Cowboys left before the playoffs, they haven't even come close to figuring it out. Coming out of their 34-29 win over Giants, it seemed like the defense was going to be the Eagles' Achilles' heel come January. And while the cracks that began to show during their recent three-game road trip didn't necessarily disappear against Oakland – like a cornerback getting beat on a double-move and untimely, drive-extending penalties – it was Foles and the offense that suddenly became the biggest concern. Against the NFL's 23rd-ranked pass defense, Foles managed to complete just 19 of his 38 passes for 138 yards and a touchdown. There were no deep passes; no successful ones, at least. And in the run game, which had been the league's best for most of the season, the Birds were held to just 78 yards on 21 carries (3.7 YPC). The Eagles weren't just unproductive against a below-average defense, they were downright sloppy. And when asked why, head coach Doug Pederson didn't seem to have an answer. "I don't know [why it was so sloppy]," Pederson said immediately following the game. "I felt like the guys were ready to go. They were energetic. They were fresh. It's been a while since we played from a Sunday to Monday. I don't know. It's tough." No, it's not. The answer is quite obvious. It's just that Pederson can't say the real reason without throwing his now-starting quarterback under the bus. Nick Foles is not Carson Wentz. That's just a fact. But ever since the latter went down, the Birds have been trying to operate as if they are. It's how they've handled every other injury this season – next man up! – and it's how they said they planned on handling the one suffered by their MVP candidate quarterback in Week 14. On Monday, even while acknowledging the difference between the two quarterbacks, Pederson wasn't willing to concede that he needs to adjust his offensive strategy. "Yeah, I mean, I hear that a lot about running the offense the same way," he said. "A lot of the plays that Carson makes are just his God-given ability to run and to make plays with his legs. It does help you out to make big plays that way. "But Nick has the ability to make big plays through the air. Believe it or not, he is pretty efficient when he is out of the pocket in finding receivers and guys down the field. We're going to continue to run the offense the way we have all season. We just have to get better execution." To a certain extent, that makes sense. You don't want to entirely scrap your offensive plan, especially one that had been working so well, this far into the season. But in addition to better execution, some tweaks are most certainly needed. The problem is, the ones we've seen so far – like the fact that Nick Foles has thrown 38 times in each of his starts, four more pass attempts than Wentz was averaging in his starts, or the fact that the Eagles have averaged 24 rushes per game since the change at quarterback, down significantly from the 31/game they were averaging previously – make little sense. And they make even less when you consider that the Eagles not only have a potent rushing attack, but also have a stable of capable backs who can help share the load. If anything, the Birds should be leaning on their ground attack, not shying away from it. And if you need proof of that fact, simply look at the Birds' lone touchdown drive against Oakland, when they ran the ball on nine of their 11 plays. All three of their backs were involved, and that heavy dose of ground-and-pound helped set up the eventual scoring play, a 17-yard screen pass to Jay Ajayi. Not only was it the one time the Eagles offense found the end zone all night, it was also the last time Corey Clement (2 rushes, 14 yards) would carry the ball all night. And if you take that drive out of the game, the run-pass ratio for the Birds looks even more insane than it already did: 36 passes, 12 rushes. Had they been losing big, maybe you can rationalize a ratio like that, but that wasn't the case. It almost seems as if Pederson truly believes that his offense is the same without Wentz. And instead of using these last three weeks like a mini-preseason (for the playoffs), when he could've been figuring out the best game plan for a Foles-led offense, he's been acting like it's business as usual. In his first game against the Giants, Foles looked more like Wentz then many expected, throwing four touchdowns and no interceptions in the win. He looked like 2013 Nick Foles, the one that threw 27 TDs to just two interceptions. A win is a win. No need to change. We're fine. Monday night against the Raiders, we saw the other side of Foles. But thanks to some improved play on defense, the Eagles were able to come away with a win. "We found a way to win," Pederson said. "That’s the bottom line. We found a way to win. I'd love to win 40-3 or 34-28, but sometimes you're going to be in these games. We got to be hard on ourselves as coaches and players looking at this film, moving forward, and get things fixed offensively. I thought the defense played really, really well. They kept us in the football game, special teams. [It was a] team effort, though." They'll need more of those team efforts moving forward, as the defense and special teams will need to play lights-out if what we saw against the Raiders is the new normal from Foles and the offense. 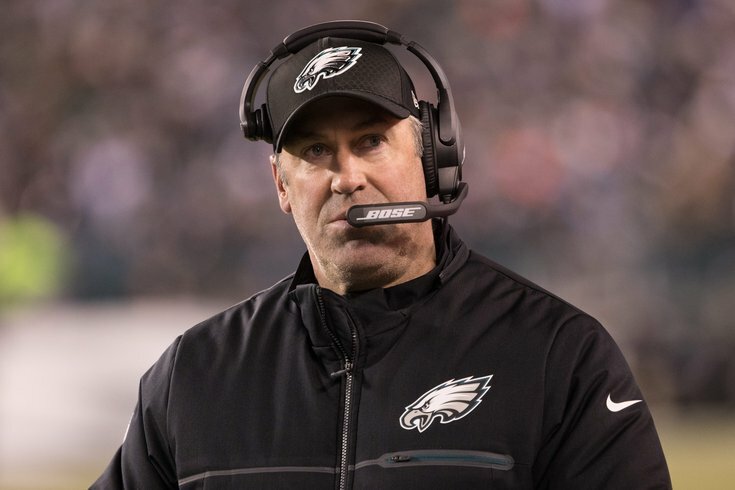 If the Eagles are bounced from the playoffs early, it won't entirely be on Pederson – after all, not many teams can recover after losing a player who was as impactful as Wentz – but it's going to be hard not to look back at these three games and wonder whether he put too much of an emphasis on maintaining the status quo and clinching the No. 1 seed when he instead should've been focused on figuring out the best way to win in January. "We found a way [to win and are] sitting here today 13-2," Pederson added. "Everybody's got to come through [Philly] now. That's the exciting part." Unfortunately, the harsh reality is this: It doesn't matter where the Eagles play if they look anything like they did against Oakland. Not in the playoffs. "Moving forward, they're all going to be dogfights," Pederson said. "Every team we face from here on out, obviously they're playoff-caliber teams. It's going to be a dogfight each week. You can't make the assignment errors and mistakes [that we did Monday night] and expect to win a postseason game moving forward. "We’ve got some work to do still in these next couple of weeks." Hopefully, it's better than the work they've done over the past couple weeks. But, hey, a win is a win, right?